After four years of work, Gates and Allen began producing their operating system MS-DOS for IBM but retained the right to license the program to other companies. Microsoft revenues rose quickly and exceeded $140 million in 1985. 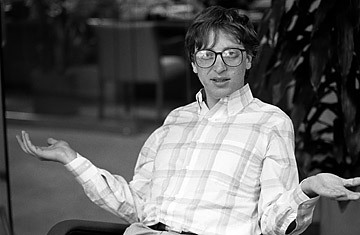 Just two years prior, Allen had received a diagnosis of Hodgkin's Disease and ended his full-time work at the company, leaving Gates and then business manager Steve Ballmer at the helm. In its third and final location change, Microsoft moved its offices from Bellevue, Wash., to Redmond, a suburb of Seattle. On March 13, 1986, the company went public; the share price rose from $21 to $28 on the first day of trading. Video: "Bill Gates on How to Fix Capitalism."